October started in the most lovely way I could have wished for: planting a mostly edible native plants garden in Saratoga in the balmy, tasteful weather. 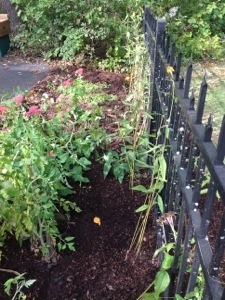 We have a proud line of 12 Jerusalem Artichokes (Helianthus tuberosa) on either side of the fence, with some Goldenrod “Fireworks” (Solidago rugosa) interplanted. The front edge is June-bearing Strawberry (Fragaria spp. 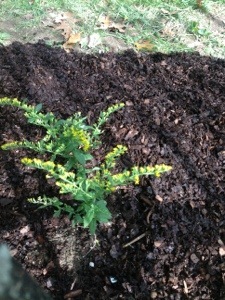 ); we used an age-old companion planting trick with the Goldenrod and Strawberries in close proximity: the Goldenrod will increase traffic of honeybees to the garden which will in turn increase our Strawberry yield. Two other noteworthy plants utilized were Blue Lobelia (Lobelia siphilitica) and Beebalm (Monarda spp.). These native plants will collectively attract birds, butterflies and other pollinators, and offer them some habitat, shelter and food. Garden design that incorporates food for humans, native plants, beauty and some wildlife habitat is exhilarating. 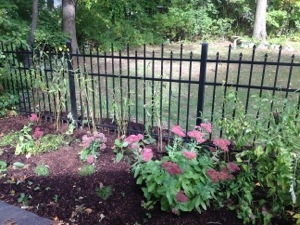 As the photos show, this Saratoga garden has a forest edge and thus wildlife traffic will be heavy. Garden design in Saratoga feels like pioneering sometimes, into new corridors of beauty and possibility.